Stokes has joined Hibs for a second time after a successful spell at Easter Road between 2009 and 2010. 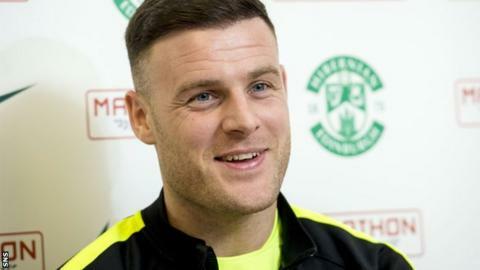 Anthony Stokes hopes his loan move from Celtic to Hibernian can help him earn selection for Republic of Ireland's squad for Euro 2016. Stokes turned down offers from Inverness Caledonian Thistle and Dundee United to move to Easter Road until the end of the season. "It'll all come down to how well I do for Hibs," Stokes told BBC Scotland. "If I score goals, if I perform on a consistent basis, everything else will fall into place if I do that." The striker, 26, has won eight caps for Ireland, the last of which came in November 2013 against Poland. "Representing my country is probably the highest honour I could have ever thought about getting as a footballer," Stokes continued. "Everything that goes with your club is great but representing your country is something special." Despite falling out of favour at Parkhead and making just two appearances for the champions this season, Celtic manager Ronny Deila reiterated that Stokes could still have a future at the club. The Irishman hopes that proves to be the case. "I want to go back there next year. I want to go back a stronger player, fitter and maybe more confident if I can come here and score goals. That's all I'm worried about at the minute. "Everything that has happened this year is in the past now, I'm just looking forward to finishing the year strongly with Hibs. "I haven't played a lot of football lately and it is difficult to get thrown in and play games but you're only going to get match sharpness by getting 90 minutes under your belt. "That's why I'm looking forward to coming here and I'm relishing the opportunity to help Hibs as much as I can between now and the end of the season."